Today’s the start of this year’s Advent cycle, leading up to another Christmas. We know when Jesus came, and where. That happened about two thousand years ago, near the east end of the Mediterranean. Advent is the season when we look back at our Lord’s first arrival. That’s important. Last Sunday’s Gospel reading, Luke 23:35–43, reminded us of a conversation our Lord had while being crucified. You know the rest, from Luke 23:50–56: Joseph of Arimathea asked for the body, shrouded it, and laid it in a fresh tomb. Women who came with Jesus from Galilee made sure they know where the tomb was and how to get back to it. Then they prepared spices and perfumed oils. That was all they had time for before resting on the Sabbath. The women were back at the tomb at daybreak after the Sabbath, with the spices they’d prepared. They couldn’t find our Lord’s body. It wasn’t there. “While they were puzzling over this, behold, two men in dazzling garments appeared to them. “They were terrified and bowed their faces to the ground. They said to them, ‘Why do you seek the living one among the dead? Nobody believed them, of course. “10 When they saw him, they worshiped, but they doubted. 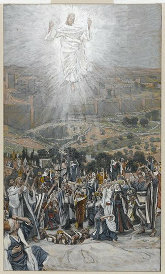 “11 Then Jesus approached and said to them, ‘All power in heaven and on earth has been given to me. That was two millennia back. Our Lord is still doing whatever’s mentioned1 in John 14:3, and the standing orders haven’t changed. If Jesus was anybody else, we’d have stopped expecting his return long ago. There’s more to being prepared than watching and waiting. Part of our job is spreading the best news humanity’s ever had. Being part of the family includes accepting my part of a job that’s not even close to being finished. Thanks to a bad decision we made when humanity began — I’ve talked about that before3 — we’ve been treating each other badly. The job will take time, lots of time, since it involves radical ideas like peace, solidarity, justice, and liberty. But I think it’s worth the effort. I also think that we have no time to waste. This entry was posted in being Catholic and tagged Advent, civilization of love, evangelizing, future generations, holidays, Jesus, love, peace, salvation, social justice. Bookmark the permalink.